In addition to publishing research, the Visualizing Finance Lab engages the New York and the New School community in workshops, art opening, and talks. Beyond events, the VFL develops pedagogical frameworks, thought pieces, and even cartoons to kickstart financial literacy education. Here are some highlights. Through our project “Money Diaries with the Other 90%” the VFL aims to develop an online platform for the other 90% to share detailed financial stories that reflect the reality of how much things really cost, enabling an underserved segment of the population to share honest and realistic journals across a broad range of financial stories. As data aggregate, individuals will also be able to position their own behaviors within trends for others in similar financial and other situations. Extending the concepts of Refinery29’s Money Diaries (R29MD) platform, an online forum for young women to talk about their money decisions, the VFL platform is directed towards people in a demographic not represented in Refinery29’s current system– to log their spending. While R29MD is engaging and may affect financial behaviors, its worth as a Financial Literacy Education (FLE) tool is limited, as the stories typically feature affluent individuals with extra financial resources: contributions-in-kind of the sort that upper-middle-class individuals expect, and often receive. Ignoring the impact of these contributions may mislead R29MD readers, who will associate a particular lifestyle with an inaccurate declared income. In contrast, our project will provide participants and readers with honest and realistic journals that reflect a broad range of authentic financial stories. Visualizing Finance 1.0: Developing a Common Language was a one-day symposium within a six-day exhibit in the Arnold and Sheila Aronson Galleries at Parsons The New School for Design in New York City in late October 2010. The purpose of the symposium was to facilitate communication among designers, art directors, fnancial educators, fnancial institutions, and the public, and to explore the process by which fnancial illustrations are created for journalistic and educational purposes. The relationship between text and illustration in conveying financial information is under-theorized; too often visualizations are regarded as implicitly-understood accompaniments to the written word. The exhibit presented an invited selection of illustrations by artists whose work has appeared in The Economist, The New York Times, and other prominent venues. The symposium was held in the exhibition gallery, so participants could refer to the illustrations around them while making observations. In the display space adjacent to the gallery were exhibited a video animation, several sketches from a professional fnancial planner and blogger, and examples of student visualizations from a Financial Management course at Parsons. 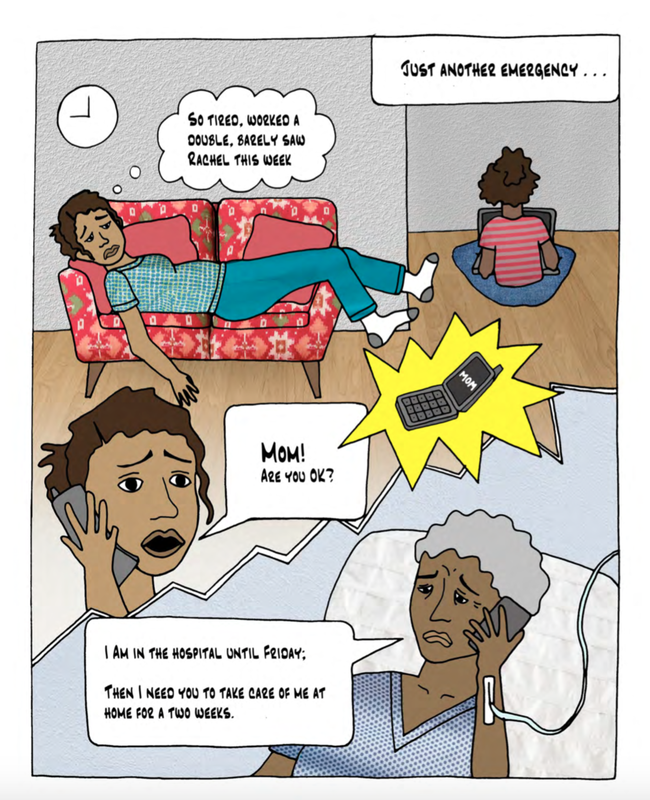 In February 2015 the Visualizing Finance Lab partnered with Neighborhood Trust Financial Partners to create a comic narrative based on “Emma’s Story”; a character and narrative developed for use in Neighborhood Trust Financial Partners’s Getting Ahead workshop aimed at low income and financially stressed new yorkers. There are more than 8 million ordinary objects in this city that carry within them a sense of its inimitable expression. They express its thundering diversity or a thorough particularity; they connect us to other places, past and present, or moor us to the here and now; they enliven or aggravate daily life; they epitomize the city at large or hold true to one of its neighborhoods. They may be small, held, and mobile or large, unwieldy, and stationary. Well-designed or just well-used, they live and survive, carried by the city’s inhabitants from place to place, from generation to generation, creating a ripple of small meanings. This exhibition features 62 objects selected by designers, artists, anthropologists, sociologists, historians, writers, musicians and others — all faculty at The New School and inhabitants of New York — that each narrate a biography of this place. They are variously historical, cultural, technological, organic, novel, typical, skilled, shoddy, mundane, luxurious, exclusive, popular or sensual. In assembling these objects, the exhibition instantiates Parsons’ new undergraduate curriculum; specifically one of its core courses, Objects as History: From Prehistory to Industrialization, which uses objects found in New York City collections to introduce students to world history as expressions and embodiments of particular places and times. Acknowledging the justifiably famous British Museum exhibition and radio program, A History of the World in 100 Objects, this exhibition situates objects as narratives of the present. How do we visually communicate information? Often the tools deployed are far less sophisticated than needed. To improve visual storytelling for hard data, we created an editable PDF called the infoEmotion Matrix. In a Design 4 course in 2012, students were prompted to create a skit in which two of your group will play the role of the financial counselors, and two of you will assume the roles of Jennifer and Tom. What questions should Jennifer and/or Tom be asking as credit users, and what would you advise them as counselors?